For our interior I'm the less is more girl most of the time. I find myself tossing around words like subtle and simple quite often because that's how fall is here in Texas. Fall decor for me means a few special pumpkins, definitely a few soft pillows, throws for when the air conditioner blows a little too cool, candles, and little things like that. Last year I did a post called Fall Decorating Ideas from an Average Girl that seemed to strike a chord with lots of people....maybe you are a less is more decorator or maybe you are average like me and although you'd like to do the seasons in an over the top way, it just doesn't happen. Just remember, it's your home and you should decorate in a way that pleases you. 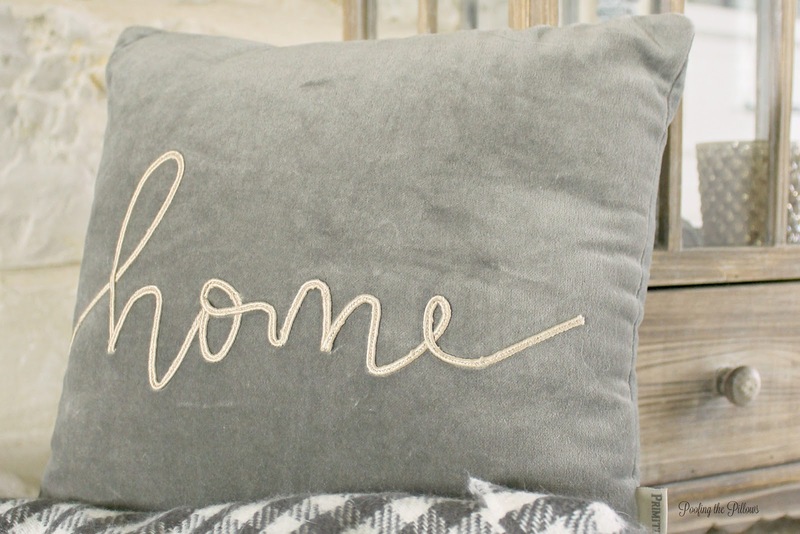 In our home, pillows have been switched from room to room with a couple of velvet pillows from Pottery Barn added into the mix. Velvet for the win! I love the beautiful soft texture that velvet adds to the room and as the season goes along, I may add more! Over at the fireplace, I recently purchased this really large lantern at Hobby Lobby. I love it! It may need a coat of paint to make it stand out from the limestone just a bit more. What do you think? It's so much fun switching out the contents of lanterns and glass containers seasonally. I pop something in...stand back and look...then tweak it a few times. What to do around the big tv is always a big question for me so I chose to keep it simple with a chunky candlestick on each end. As a total aside, please tell me what's on your fall tv watch list! I'm thinking of walking away from This Is Us. By the way, did you see our dining room dressed for fall? 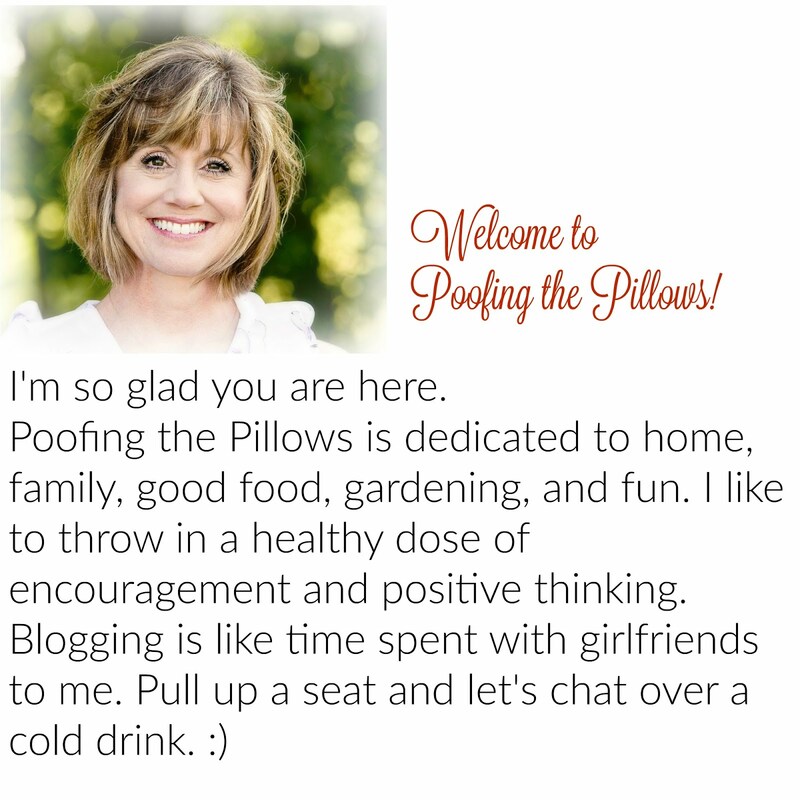 Also, Poofing the Pillows was featured last week on the Life on Lemon Lane YouTube channel. Pop over there to see a walkthrough of our living spaces and tell Patty I sent you. Now to continue with the Fall Festival Blog Hop... thank you for stopping by today and I hope you'll visit more of these lovely blogger homes. Next stop is Follow the Yellow Brick Home where Amber knows how to incorporate vintage finds with amazing finesse! Wow! I can't figure out what to respond to first. 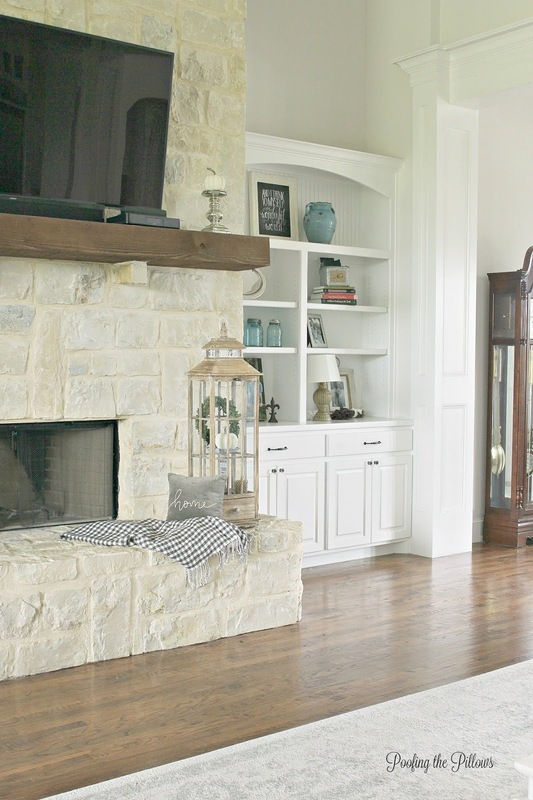 Your new blog layout (which I love!, looks awesome) or your stunning Family Room. That fireplace is wonderful. P.S. I like the lantern as is, it looks good to me. Your home is so pretty Stacey, and I love that you kept it simple! It's cozy and charming! LOVE that lantern!! Your family room looks like a wonderful place to sit and enjoy fall. Stacey... your home looks positively heavenly. I love boxwood wreaths too! Great idea to put one in lantern with pumpkin. You don't mind if I steat that idea do you? Have a wonderful week!! You did such a good job here, and those pillows are soooo darling!!! Always love seeing your pretty new home. I love that you are more neutral with touches of blue. Just a great combo. So soft and cozy. This is lovely, Stacey...I particularly love all of your wonderful throw pillows! Lovely, very single little bit. 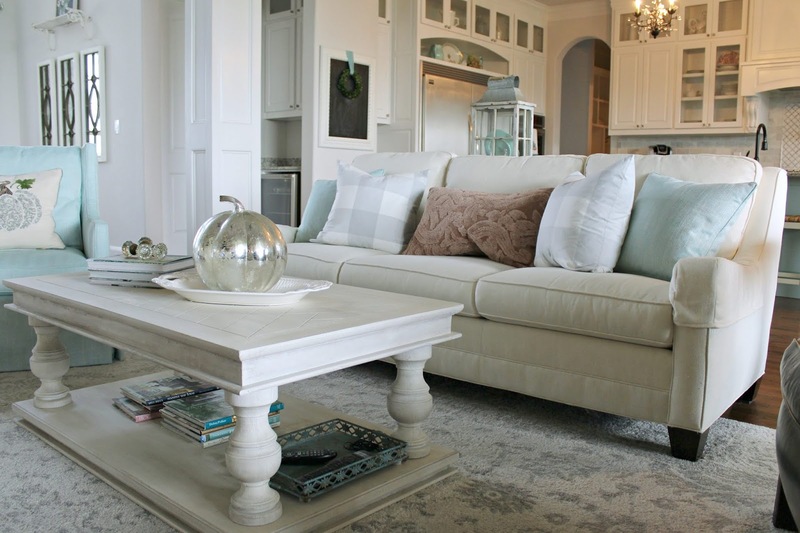 I love your clean uncluttered style Stacey, with soft neutrals and just the right pop of color here and there. Your home looks simply beautiful! It looks lovely in there. You have decorated for fall with keeping with your style perfectly. I seriously love the new lantern as is. I think it looks great and color might come with what you put in there, but I think it fits the mood of the room. Your home is always inviting and beautifully decorated... less is definitely more with your touch. The new lantern is beautiful with your fireplace, and I' m not sure I would paint it. You can add color with its contents and/or with embellishments added to the top like a ribbon and greenery at Christmas. What I am watching this Fall on TV? Two new shows have caught my attention, and I enjoyed their premiere episodes. First is 'a million little things' on ABC on Wednesdays and the other one is 'God Friended Me' on CBS on Sundays. I like Sci-Fi and watched the first episode of Manifest on NBC on Mondays. Interesting with lots of back stories to come. Time will tell if they become must-sees. Then one of my favorites... Blue Bloods on CBS on Fridays. 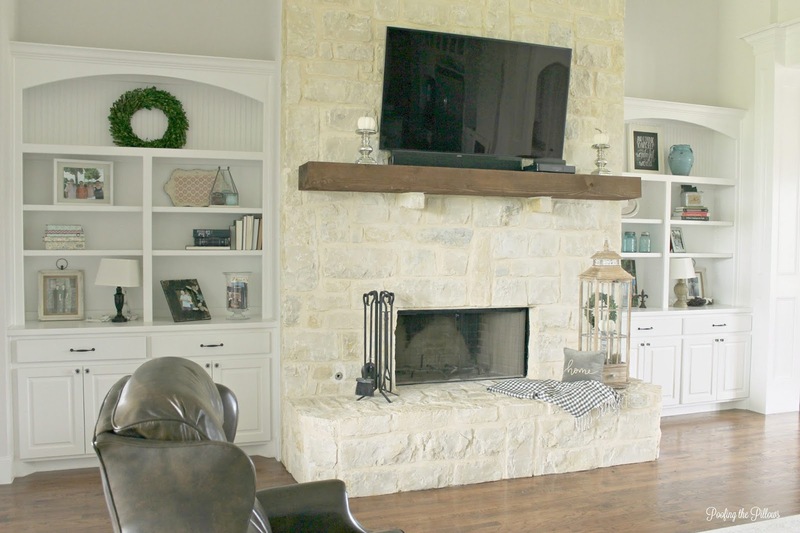 Oh gosh, I just LOVE the stonework on your fireplace and those built-ins beside it are absolutely gorgeous! 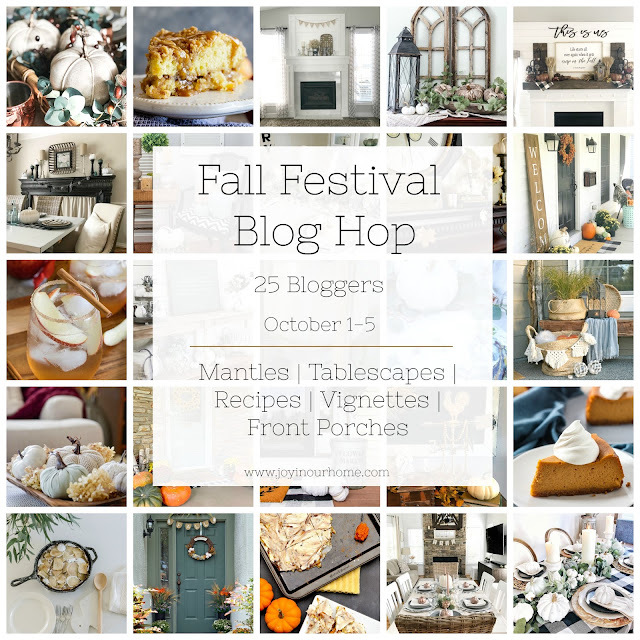 Everything looks so cozy all decked out for Fall and I especially love how simple and clean you've kept your decor! 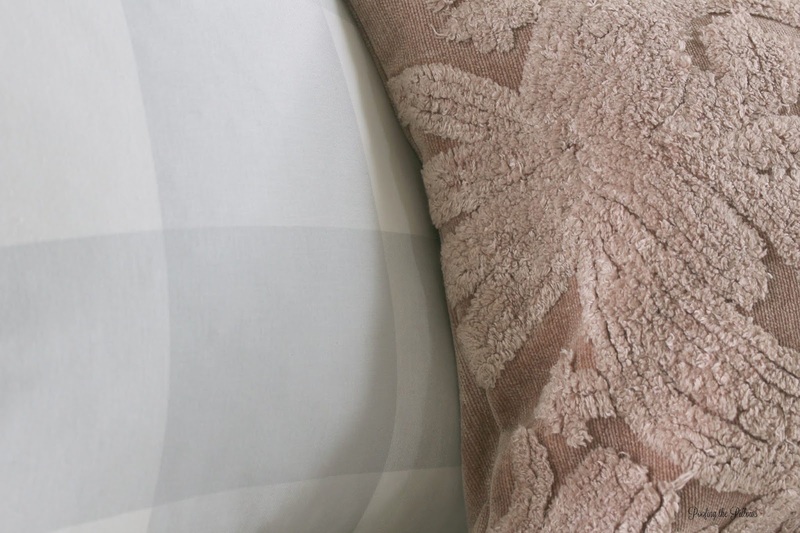 Stacey your pillows, lantern and soft color scheme is so beautiful! I absolutley love the color of the lantern with the stone on your fireplace. Your living room seems perfect for cozy fall relaxing. So happy to be hopping with you this week. Happy Fall...finally! The soft colors are just perfect for fall. Your Fall home is gorgeous! I love the simple hints of Fall. You and I decorate with the same colors. I finally got rid of everything orange. I love the soft colors for decorating. I enjoyed A Million Little Things. Why are you giving up This Is Us? I still enjoy it! Anything on Hallmark Channel is fun to watch and can't wait for a few of my favorites to return to HGtV! Oh, and the lantern is beautiful as is. I agree with the comment that it seems unusual the way it is! Your home is so pretty! I love all the fall touches! Thank you for sharing it! I'm right there with you on the "subtle" decor. With so many moves under our belt, I'm definitely all about the "less is more" way of thinking! 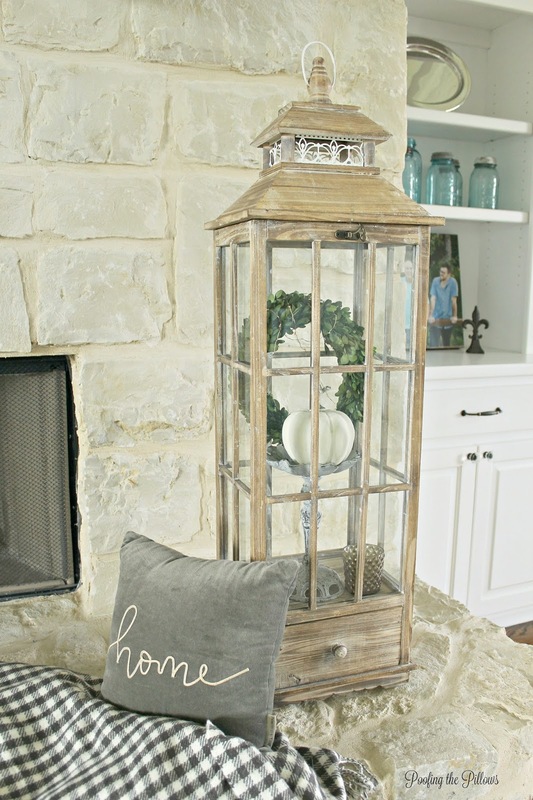 Love everything, especially that lantern on your hearth! Gorgeous! I'm working on getting back to the blog after all this time and working on catching up with all of you to see what's been going on! :-) Hope all is well! I love your "less is more" theme in the family room. It's something I think I need to embrace more :) Everything looks so clean and elegant and gives the room a relaxing vibe. So happy to be on this hop with you! Lovely. Simple is always best, Stacey! At least that's my thoughts. Simplicity and elegance all in one! Pretty, pretty! I love that you kept your decor simple!! I can do simple!! Thank you for such great ideas!! Your house is always so clean and neat. And I like the colors ...light and bright, perfect for Fall! We are watching Poldark and football! Yay Cowboys!!! I think this is gorgeous. I just love your beautiful new home. The pumpkin pillow is a cutie. Everything looks lovely! I am not very good at decorating but always do something for the various holidays. I had thought about not doing the traditional Halloween this year but granddaughter wasn't going for that. So out came the pumpkins, ghosts, & witches! Maybe when she grows up I can be a little more sophisticated! I love your lantern! My son & DIL gave me one awhile back and I have enjoyed it. Then recently I bought new one (along with some new wooden candlesticks) at Hobby Lobby half price...woop!woop! I have filled the lantern with fall leaves, small pumpkins, squash, those types of (artificial) things. Looks pretty good! Sure wish FALL would hurry up and come to my neck of the woods. Still so very hot here! Very pretty, Stacey and just right. I like your style very much. 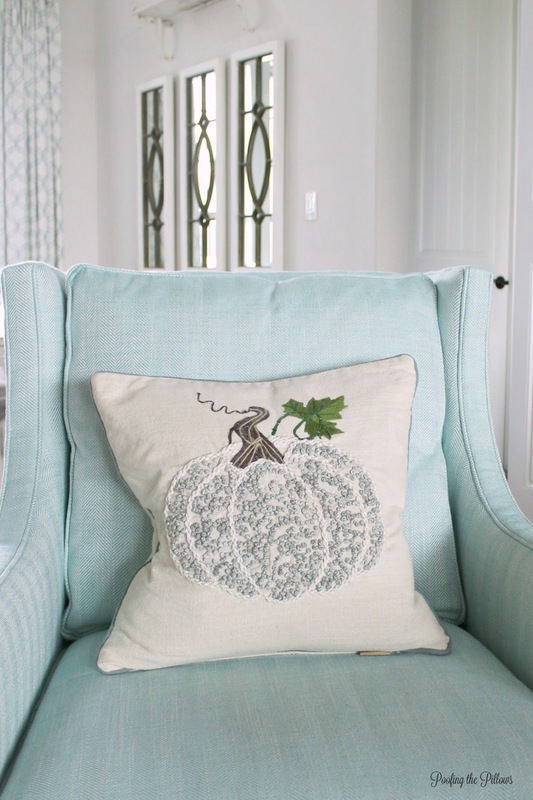 Crazy about your pumpkin pillow. Your lantern has a chic look just as it is for a great fall look. Just lovely, Stacey! I'm jealous of your bright, white sunshine! 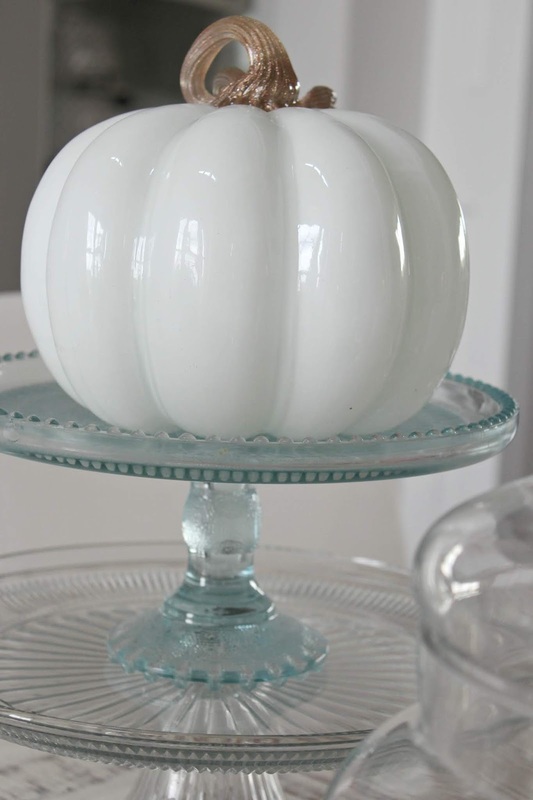 Think I've got a matching aqua blue glass cake plate to yours; one of my faves! Enjoy your subtle fall-cold and rainy already here at the opposite end of the U.S.! I'm totally thinking of walking away from This Is Us too! Soooo much drama, lol! Anyway, your fall home is lovely, as always. I love your idea of putting the two candlesticks on either side of the tv. Simple and elegant. You have some awesome pillows too. Love the soft colors. 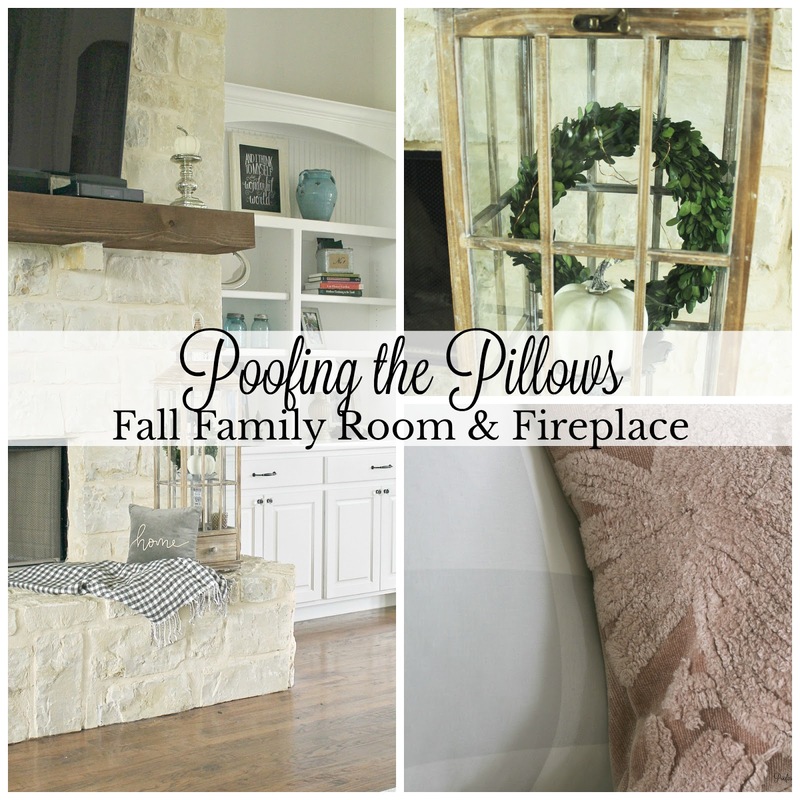 Your Fall decorations look fantastic in your family room! It looks really cosy but elegant too. Thank you for sharing, and for being a part of the Hearth and Soul Link Party. Hope you are having a great weekend! Hi Stacey! Just coming over again to let you know I am featuring you today at TFT! Hope you will join us again this week. Have a great day!